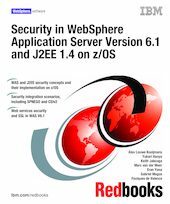 This IBM® Redbooks® publication was written with the objective to provide a technical description of some of the most important security scenarios available with WebSphere® Application Server Version 6.1 for z/OS®. We chose scenarios that are not really documented elsewhere and that have had significant changes in Version 6.1. In the first two chapters we provide an overview of security with WAS on z/OS for those readers who are unfamiliar with the security landscape on z/OS. From Chapter 3, "Web container security" on page 63, onwards we go into more technical depth.